This verse and the surrounding verses clearly exhibit the three main features of Hebrew poetry which are the ubiquitous use of imagery (see verse 6), parallel repetition (see verse 6 again), and terseness (as you can see in the phrase we’re dealing with). So we shouldn’t be surprised if we have to dig in a bit to figure just what the author is trying to say. We also need a little context. This line is from one of Balaam’s oracles. As Israel is on its way from the desert to the promised land they encounter Balak, the king of Moab (Num 22:4), who is afraid that this great horde of Israelites has come to take his kingdom. So he sets out to hire Balaam, the prophet, to pronounce a curse on Israel. Balak figures that if Balaam can curse Israel then that will put the odds of winning a military encounter in his favor. After all, Balaam was famous for being an effective pronouncer of curses and blessings (22:6, 15). 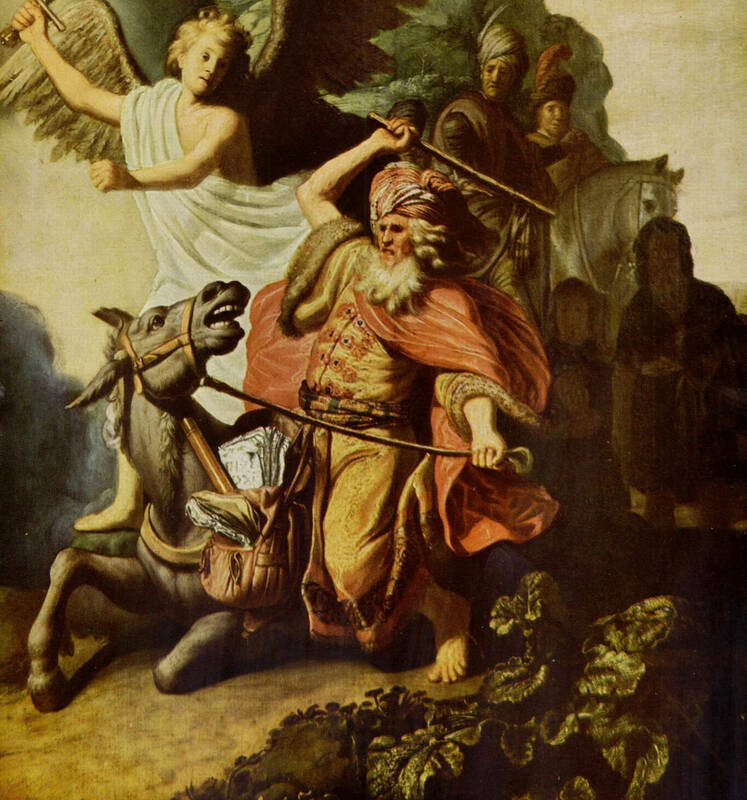 At this point Balaam gets a word from God indicating that he’s not supposed to go because this people is blessed by God and he’s not about to let Balaam curse them (22:12). 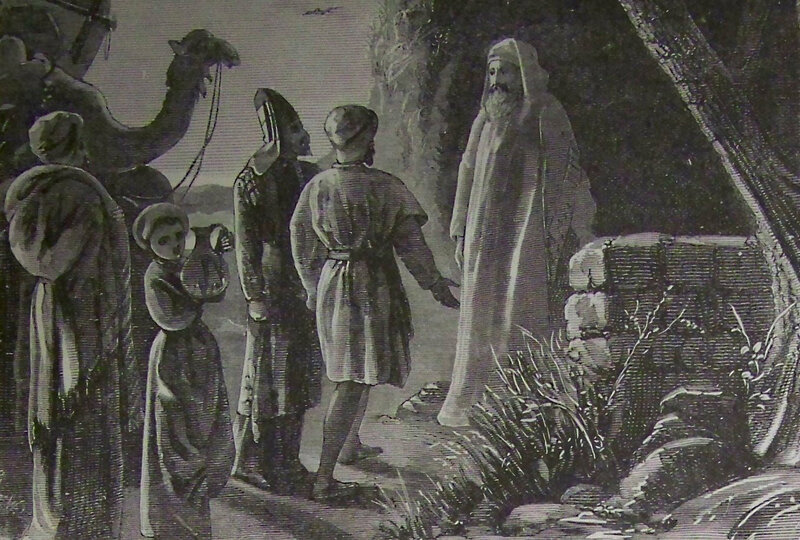 Balaam, however, tempted by Balak’s promise of lucrative reward (22:7), seeks every opportunity to do his bidding. And that’s how he ends up uttering several oracles that, despite Balaam’s contract to curse, bless God’s people. One of the first things you do when you work with a text is make sure the text you’re working with is actually the original text. We don’t have the original words written by Moses, we have manuscripts that have been copied and translated over time and that contain, as a result, copy errors or textual variants. Different manuscripts have slightly different readings so we can compare the various reading and very often figure out which variant preserves the original text. Photo Credit: Illustrators of the 1890 Holman Bible Public domain. Balaam receiving Balak’s messengers, as in Numbers 22:4 and after. Since this is poetry, we can expect there to be terseness. That is, the author may have left out some words that the original Hebrew reader would have known to fill in. Maybe, for example, he might have written, “falling into a sleep, yet his eyes uncovered.” That makes sense. The only thing is, in Hebrew it seems that sleep usually falls on us, rather than us falling into sleep. Still, it’s a possibility. Alternatively, maybe He’s fallen into a trance and yet his eyes are open. Balaam, after all, seems to be a prophet inclined to seek for a word from God at night (22:19). So maybe this is also a possibility. Which is it then? It’s hard to tell so we should take a step back and look at the context. When we look at the context the first thing we notice is that this oracle that Balaam is speaking is coming from the impetus of the Spirit of God. Balaam, willing or not, is speaking the words of God. We’ll take that into consideration as we read on. The next thing we notice is that there’s an interesting repetition going on in this text. Let me quote the text from above, this time starting from the beginning of the oracle and now I’ll also split it into strophes and number them. Take a look at the first three of the five lines. They all have the same two parts. The first part is “the oracle” and the second part is “Balaam” with some information that describes Balaam. The last two lines skip “the oracle” part and get right to the description of Balaam. This parallel repetition and ellipsis (leaving out “the oracle” in the last two lines because we’ve already gotten the idea) is typical for Hebrew poetry. If you start looking for this kind of thing in the Psalms, for example, you’ll find it ev-ry-where. Oh that works out so nice as an A-B-B-A structure! The first line in each pair includes “the oracle” the second line in the pair doesn’t; the second lines basically repeat the first line but uses different words. Now we know we got this right because it matches up with just the kind of thing we would expect from that sweet Hebrew style! Now here’s where we see how helpful it can be to understanding how Hebrew poetry works. First, we can see that the two A lines are parallel and that means they are saying basically the same thing. That’s why we can use the first line, which seems clear, to decipher the second line, which is not so clear. We can go even further with this. We can notice that all five lines are probably meant to work together to say one thing about Balaam. That is, Balaam is a guy whose eyes are open to seeing and hearing the word of the Lord. At this point I feel pretty confident we’ve nailed the overall gist of this text. But does it help us? Can we say anything about what it means, “falling down and eyes are opened?” Is this saying that prophets of the Lord went into trances and that’s how they sometimes received a word from God? Yeah, well, maybe. Except for one more thing. 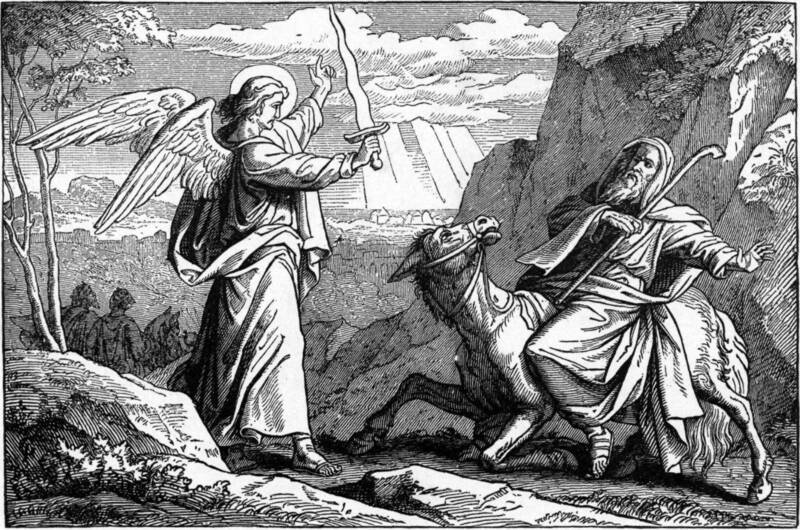 Let’s consider once more the repetition of the idea of Balaam’s eyes being opened. Back in chapter 22 we have a very interesting story about Balaam and his donkey. Right at the beginning of the donkey story, even though God himself had told Balaam to go ahead and follow Balak (20), he’s not at all pleased with the fact that Balaam is doing this (22:22). This should clue us in to Balaam’s motive (filthy lucre). What we have next is a story that gives us a very clear view as to just what kind of prophet Balaam is. He’s the kind of ‘clairvoyant’ who couldn’t see a messenger of the Lord even if one stood right in front of him three times, in plain sight to even a stupid donkey, and even if the messenger were on a narrow path waving a sword and threatening to kill him. Even a stupid donkey could figure that out! This story sets up the donkey as a foil for Balaam. That means it puts Balaam together with his donkey in a way that invites us to look at Balaam in comparison to his donkey. Yep. You got it. 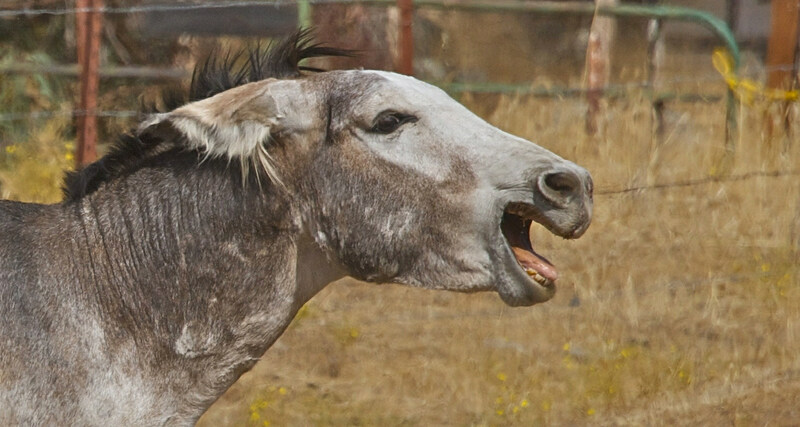 Balaam is dumber than a donkey, blinder than a shrew, not the sharpest knife in the drawer and he couldn’t hit the broad side of a barn from three feet away. Let me just point out that this story about Balaam and his donkey is here for one reason. This is THE story in the whole narrative about Balaam that clues us in to what God really thinks of this guy. So can we just go back and take on more look at that text again? And let me just remind you that this is really the words of God, not Balaam. If you get it, you should be the one falling down because this is funny. This is an excellent example of pure no holding back but still oh so sweetly subtle irony. Read in the context of the story overall, this text is saying just the opposite of what it says on the surface. God is making shameless fun of Balaam, with words coming from Balaam’s own mouth! I don’t actually know where this student was going with this question but it’s possible he was trying to understand how prophecy works in the Bible. If that’s the case, then this text is a very good example of why we should be careful as we interpret. Sometimes the text may not mean what it seems to mean on the surface.